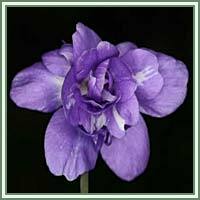 Habitat: Common Violet is native to Europe and Asia. 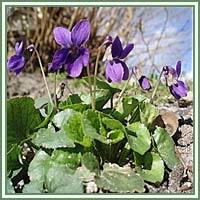 Description: Common Violet is a perennial plant. It has a creeping root and smooth, dark-green cordate leaves, with slightly serrated margins. Leaves grow in a rosette at the plant’s base. Depending on the soil, flowers can vary in color: from deep purple and blue to pinkish and yellow-white. They are five-petaled and appear from March to June. Useful components: Phenolic glycosides, gaultherin, violutoside, saponins, flavonoids, odoratine. Medicinal use: Common Violet is mainly used as a herbal remedy in cases of various respiratory ailments. It can be very beneficial in treatment of congestion, coughs and sore throat. Taken in large doses, root of Common Violet can be used as an emetic. Used in form of a decoction, it acts as a mild laxative. Recent studies have shown the presence of glycoside of salicylic acid in Common Violet leaves, which explains its efficient use in cases of headaches and body pains. Syrup made from Common Violet’s flower has anti-septic, anti-inflammatory, laxative and expectorant properties. It can be helpful in cases of various respiratory conditions, but also in treatment of headaches, insomnia, dizziness and exhaustion.